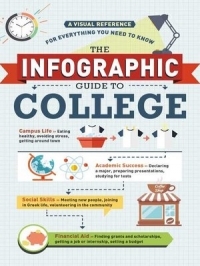 This handbook is a quick read composed of 119 pages, broken into 4 sections (Campus Life, Academic Success, Social Skills, and Financial Aid), which are then sub-divided into between 10 and 14 two-page spreads. The color scheme is simplistic, varying from duo-chrome to more thoroughly multi-colored pages with a hefty use of symbols and base images interspersed. Lists, highlighting, strategic spacing, and a variety of font styles are also utilized to prevent blocks of text from becoming too daunting. The presentation is pretty straight-forward and effectively factual. Note: While it may initially seem as though the book’s advice on Spring Break is entirely vacation focused (appealing only to the more fiscally endowed students), this is later amended on page 38, where tight budgets and alternative options are taken into consideration. * Although there are plenty of practical step-by-step instructions, there’s little explanation offered as to why certain things should be done. (Example: In the section explaining how to do laundry, it’s stated “Don’t forget to clean out the lint trap!” But it does not mention that failure to do so may result in a serious fire hazard.) Those who prefer to be given the reasoning behind directives will need to supplement with their own research. * Faith-based clubs and organizations of any sort are completely left out of mention, though it’s reasonable many students may find this a desired part of their college connectivity and social support structure. A sufficiently solid choice for recent high school grads and/or reluctant non-fiction instructional readers, as well as a potential quick refresher for all those pressed-for-time parents.